Security technology is becoming more sophisticated but examine your options carefully before you upgrade. With the release of the latest Apple iPhone – the 5s – a new security feature is now available, and the reviewers are all abuzz about this more convenient variant on privacy and data protection. But is all the hype really warranted? There have been many great innovations and improvements in technology security and authentication over the years. Each type has its benefits and drawbacks. So, with all of these options, which is the best for your personal and business data? The basic forms of data security fall within one of three main categories: biometric, possession, and knowledge factors. Biometrics (i.e., what the user is) are the unique physical traits of the user that can be measured and compared, such as a voiceprint, iris scan or, most commonly used in everyday technology, a fingerprint. 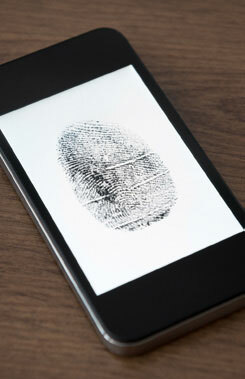 While only you possess the originals, biometric factors are nevertheless vulnerable to being copied. elevator buttons, cups or glasses, and any other non-porous surface. conditions and facial expressions for their effectiveness and can be fooled by a simple photograph. Possession factors (i.e., what the user has) essentially rely on a key-and-lock system. The ‘key’ may take many forms, such as a keychain token, smart card or a small device designed to interface with the machine, such as a USB or audio port token. Possession factors are relatively uncommon on their own for computing security, although they are frequently used as part of a multi-factor or two-step system (something we’ll touch on a bit later). The primary weakness of using a physical object as an authentication mechanism is that it may be stolen or damaged. Think of someone who has the keys to your home, for example; they would have unrestricted access to everything inside! longer passwords that use a combination of numbers, symbols and both upper and lower case letters are considered to be more secure. Unfortunately, the longer and more complex a password becomes, the harder it is to remember! A four-digit PIN has 10,000 potential combinations; a sixdigit PIN has one million. PINs and patterns, commonly used by financial institutions and Google’s Android operating system respectively, have the advantage of being easier to remember. Depending on the number of digits in a PIN or dots in a pattern, there may be fewer potential combinations. A standard four-digit PIN, for instance, has only 10,000 potential combinations. On the other hand, a six-digit PIN has one million. Patterns, as implemented in Android, however, have fewer possible combinations than PINs, mainly due to the number of dots, and the inability to “re-use” the same dot twice. although it is becoming more commonly available in consumer applications. Google, Facebook, Twitter and other major online sites are now optionally offering some form of two-step authentication as well. While Multi-Factor Authentication is arguably far more secure, the limitation is that the system itself must be set up to use two-step authentication. Unfortunately, since most software programs don’t have the option to add a second step for authentication, a password is the only option available. enough to keep prying eyes from your personal email or Twitter feed, but you might consider using something more secure for your financial accounts or sensitive client data. Regardless of the kinds of authentication you’re using, a little common sense can go a long way. Use a password that’s sufficiently secure, never share your PINs or passwords, and don’t write them down!